The Spanish government will deploy 500 police officers in Catalonia in the run up to ‘La Diada‘, the Catalan National Day, on 11 September, and the first anniversary of the independence referendum on 1 October, police sources have confirmed. Around 100 extra Spanish police officers are already in Catalonia, taking the total figure of extra officers to 600. Officers from all around Spain will come to Catalonia to support the Catalan police force, the Mossos d’Esquadra, in securing and protecting public buildings. However, sources in the Catalan government say they have been not notified of this deployment. Tomorrow, the Catalan and the Spanish governments will meet in Barcelona for a bilateral meeting on security and police cooperation, the so-called Junta de Seguretat, which has not been held in years. Also this week, the Spanish government temporarily suspended transfers of Guardia Civil officers deployed in Catalonia that had been offered posts in other parts of Spain. According to sources within the Spanish home affairs ministry, they have been asked to stay at least until 15 October, due to expectations of a heated autumn. 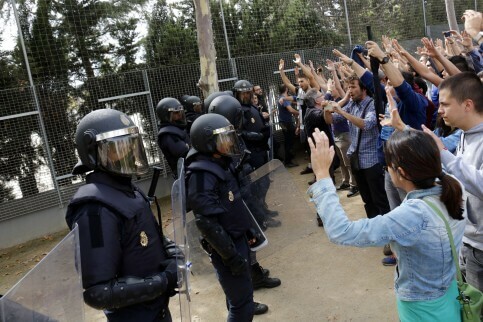 A year ago, the Spanish government deployed over 4,000 officers from the Spanish police and the Guardia Civil. Most stayed at hotels and in large ships in the ports of Barcelona and Tarragona. Their presence was very controversial, as they were ordered to stop the organisation and celebration of the independence referendum on 1 October. Spanish police tried to stop the referendum using an ‘excessive’ and ‘disproportionate’ use of force, according to Human Rights Organisations such as Human Rights Watch or Amnesty International. More than 1,000 people were injured on referendum day last year.